1. "It's a tax on gardens"
The short answer to that is: "No it isn't. It's a tax on where the garden is. If you really want to live in an expensive area and have a big garden, then the tax will indeed be very high, but if it's the garden that is important to you then you will always be able to find something affordable. You just might have live in an area where gardens are the norm and where there is no particular premium attached to them (less scarcity value), which is in fact nearly all residential areas." The long answer (see below) comes to exactly the same thing, but involves actually knowing about land values. I have seen people advance The Poor Widow Bogey and this argument together, which just shows that the Homeys care little for logic or any sort of intellectual coherence. The interests of Poor Widows In Mansions and families with children who want to buy a house are diametrically opposed. Even more irritating is that in the next breath, the Home-Owner-Ists say that 'local services' should be funded by a Poll Tax. That really would be a tax on families i.e. larger households, who would clearly pay more under a Poll Tax and less under LVT. While LVT would increase the tax payable by Poor Widows In Mansions, a Poll Tax is the equal and opposite and would increase the tax bill payable by Poor Widows in lower value housing, who probably deserve more sympathy. A shift from taxing output and employment to taxing land values will increase the tax payable on the Poor Widow's Mansion (and thus will ultimately be 'paid' by heirs who will receive a smaller or no inheritance) but that same tax shift will enormously benefit working families with children, and especially young couples who would like to settle down, move out of their flat into a house and have kids. The heirs' loss is the family's gain. The online tax app enables you to enter your own figures for earnings/household composition to see how much tax a working family would save. This assumes they've already bought a house and are stuck with the mortgage; in future, the savings to families ought to be a lot more because house prices will go down so their mortgage payments will be lower. When challenged, the Homeys will then deny that there is any contradiction and then say that shifting to LVT, combined with a Citizen's Income/personal allowances will also "hit" single people hardest, because they get the least in Citizen's Income/personal allowances. The irony of all this is lost on them. 2b. "It's wrong to assume that employers will pass on their NIC savings as higher wages"
Common sense tells us that making employer's pay a payroll tax on wages out reduces headline wages; economic theory tells us that the supply of labour is less elastic than the demand for it, so employees end up bearing most of the Employer's NIC. Be that as it may, and even if the assumption is wrong (which it isn't), there is an easy answer to that, assuming we want wages to be taxed at an overall flat rate (20%) the means that the worker should receive 80% of what the employer has to pay (in NIC or in gross wages). So we could leave Employer's NIC at 13.8% and tax the gross wage at 9%. So for £113.80 paid by the employer, the employee nets £91, which is 80% of the total paid. 3. "It's an attack on single people who'd have to pay as much as a couple or a family"
Hang about here, first the Homeys say that LVT an attack on families who tend to need larger homes, and then they say that LVT is an attack on single-adult households. Those are completely contradictory (and both are wrong, as it happens). I even once saw the non-logic taken to its perfectly circular non-logical conclusion: the Poor Widow In A Mansion would be "forced" to pay more than the millionaire City banker living in a small flat; the Hard Working Family would be "forced" to pay more to live in the sort of home with a garden which the Poor Widow lives in; and... [drum roll] a single adult would be penalised because they would be "forced" to pay as much as a family. If you mention Citizen's Income then the Homeys get even more rabid, because clearly this doubles-up the discrimination against single people (Poor Widows or not) and is simultaneously a subsidy for feckless single mothers. Actually, the people who will benefit most from this are larger households, i.e. families. 4. "FOOTNOTE: The close correlation between build density and land values"
For most towns and cities, the "centre" is literally in the centre, but in some places, such as seaside/tourist towns, the "centre" is the beach. What people pay for is the view over the beach and the sea and that value to the individual is largely unchanged whether you share the view with a hundred or a hundred thousand other tourists. So the value of the land along the beach front is very high. We can see that with our own eyes and understand it, but the key to all this is that the same general principle applies to normal towns and cities. Even though the physical land in the "centre" is the same as anywhere else, the same effect (massive disparity in values between the "centre" and surrounding areas) is observed. When discussing land value tax, it soon becomes apparent that people do not have a clue about land values (in terms of absolute rental values or relative or absolute selling prices). 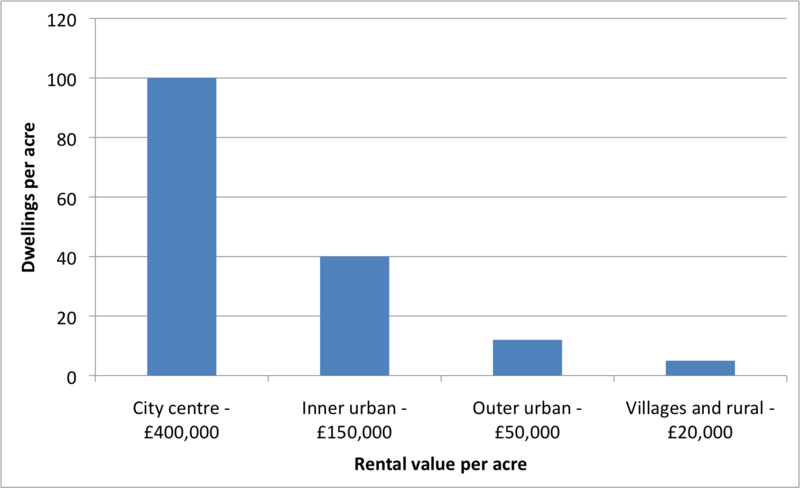 - Rental value of farm and forestry land (per acre) = between £5 and £100 a year. 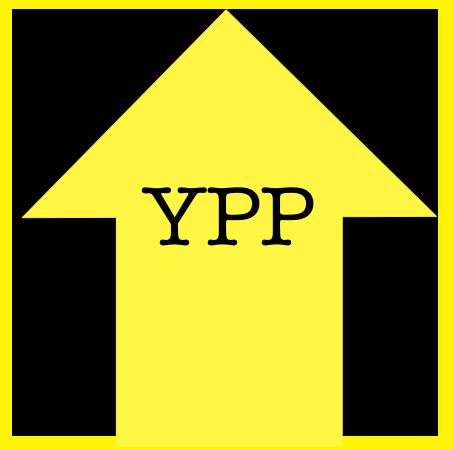 - Site premium of a residential plot with a semi-detached (around a tenth of an acre) = between £3,000 (bottom decile) and £11,000 (top decile) a year, with more or less no upper limit in the top decile. b) So the ratio between the rental value of average residential land and average farmland is about one thousand; the ratio between land used for office space in Manchester (assuming a ten storey block etc) and average residential land is one hundred; and the ratio between central London and normal Manchester is another ten (or whatever) on top of that. Multiply all those up and there is a ratio of one million between the highest and lowest rental values on a per area basis. c) Even if you are baffled by these numbers or the fact that the ratio between the highest and lowest rental values is something like one million (meaning that Central London has a higher rental value than the whole of Aberdeenshire), land values are made clearly visible by how densely built an area is. City centres = skyscrapers with no gardens and just a few public parks. There can be hundreds of dwellings per acre, depending on how tall the skyscraper is and how big the flats are. Inner suburbs = blocks of flats or terraced housing, between twenty and fifty dwellings per acre. Small gardens if any. Outer suburbs = mainly semi-detached, between ten and fifteen dwellings per acre. Commuter towns, market towns, rural areas = have the most detached houses, densities of less than ten homes per acre, could be less than one for scattered farmhouses. There is a premium attached to being in The Green Belt (the Faux Bucolic Rural Idyll) but this is offset by the negative premium attached to being far away from town centres (where the best paying jobs are). e) "Hang about here," shouts the crowd, "If we divide the rental value by the density, the answer is always about £4,000. Do you mean to say that the site premium is about £4,000 wherever you live? That flats cost as much as semi-detached houses?" Yes, that is exactly how things are. If you look in the estate agent's window, you will see that in most areas, a one- or two bedroom flat costs about 60% as much as a semi-detached house. But we also know that most homes in city centres (expensive land) are flats; and most homes further out (cheaper land) are houses. The two effects more or less cancel out. Yup. The average selling price of flats in England is slightly higher than the average selling price of semi-detached houses. f) So the long answer to bullet point 1 is exactly the same as the short answer. The rental value of most dwellings is in a surprisingly narrow band, everybody makes a trade-off between convenience/less space (city centre flat) with longer commute times/more space (suburban semi) with terraced houses falling somewhere in the middle. Which debunks the stupid argument "If we had LVT, some evil developer would come along and get planning to demolish my house and build flats in my garden instead". This will be true where towns have grown up around old houses with big gardens, so what was on the outskirts of a small town (optimum use - house with big garden) but is now near the middle of a large town (optimum use - terraced houses or flats), but for most residential areas, certainly in the outer suburbs and in smaller towns, the optimum use of land is houses, detached or semi-detached. There is no latent planning gains uplift to be gained by knocking down a house and building two or three flats, because there would be little demand for those flats. People are prepared to live in flats but only because they are in city centres or inner suburbs, where the convenience outweighs the fact they have no back garden and less privacy. Add to that the fact that our hypothetical builder has just knocked down a perfectly good house and has to pay the cost of building the flats, the optimum strategy for ninety-five per cent of houses is to leave them exactly as they are.